Suffering from leukemia and pneumonia, Norma moved into her friend’s home in late 2016. The 31-year-old Eating Out star managed to raise $50,000 towards her ongoing care. It’s with a heavy heart that I share the news that earlier this morning the world lost a truly inspiring, beautiful woman. Norma is now resting peacefully in the eternal and while she may no longer physically be with us, her spirit will continue to fill the hearts of so many people. Perhaps Norma’s lasting legacy is that her story helped the world to see the true meaning of love. Norma reminded me that we all are created to love and all desire to be loved. This year Norma has helped the world see the true meaning of Valentine’s Day. To love another is not about living struggle-free or never experiencing hurt or loss, but to fully and deeply open our hearts to one another without fear. Each of us is lovable even with all of our differences. Love has no boundaries. May you rest in peace my sweet sweet lady, Norma. ?? They had been friends for many years, and Norma even occasionally helped him cruise Grindr, as any good neighbor would. Sad but very touching beautiful story. A very sweet story, that was incredibly kind of him. My hat goes off to Chris what a class act. Well done. I wanna be cared for by a cute adorable boy like Chris when I get to be really old. Oh, what a dream it would be. This is true compassion and loving kindness. Chris your a saint and I applaud you in so many ways ! I took care of my Mother till her passing I fully understand ! You are blessed among the few who see love as love ! 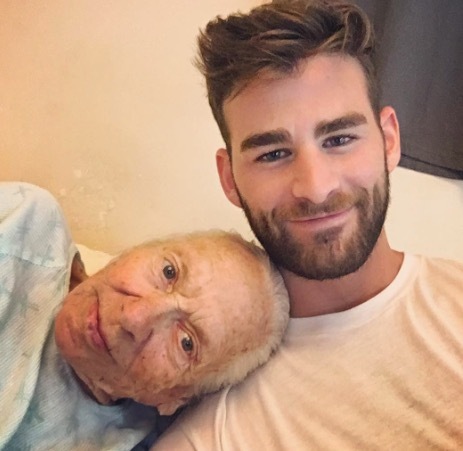 Such a nice story most we see here is about politics hate and drama She was happy in her last days being looked after I hope he continues to care for her cat in a forever home too So many seniors are dumped in a nursing home and forgotten then die alone with no one that cares by there side . I saw the CBS News report on Chris and Norma. Fell in love with him all over again. A beautiful man expressing truly beautiful and unconditional love. Thank you for the sad update. This is a man who truly understands what love means. My hat’s off to him. Sweet man, sweet story… Thank you for the update QUEERTY. Dignity is a wonderful gift to give to someone. Thanks, man. What a guy! I do not know the entire story of Norma…I read about this somewhere else…maybe someone else can elaborate on the fact that I read “no immediate family members live in the area” – so Norma was left to a compassionate, generous, thoughtful, loving stranger to take care of her. Maybe her living relatives were worse off. Like I said, don’t know her whole story…but Chris, what a big heart! 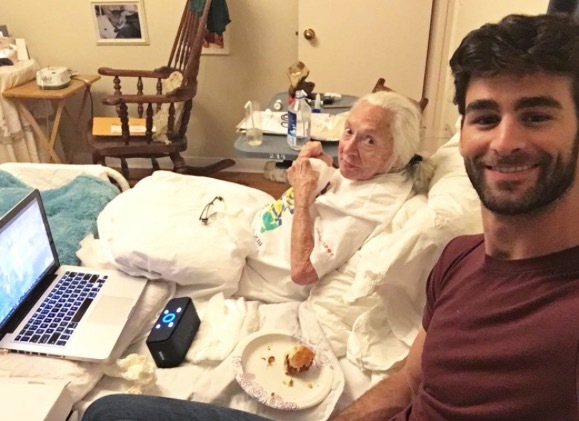 He gave her something most elderly people don’t get at the end of their life…companionship. How sad it would have been if Norma spent her final days alone. Chris you were truly lucky to be able to love someone so fully and give them all that they needed. She was soooo lucky to have you. Now she is making room for you in heaven and will be waiting patiently for the day when you two can be reunited. God bless you! It is so awesome hearing about people like him that does such extraordinary acts of kindness. I am very close to my grandmother (even though she has Alzheimer’s). And it really breaks my heart that most of my family acts like it’s soooo annoying to visit her and spend time helping (cleaning her, feeding her, etc…) her. Yes, she has “accidents”… but she can’t help it. I really wished that I could get her to come live with me and my roomie… but everyone tells me that “you can’t take care of her… you don’t have the training!” Even when I told them that my neighbor was an RN, they still objected. ***Im pretty sure it has something to do with me being GAY… because that seems to be an issue with them all the time*** I just think it is really cool for Chris to invite her (and her cat… [awwww]…) into his home to take care of her and let her know that there are good-hearted people out there… because lately, it seems people have just been mean to each other. I am sure that she was happy and at peace when she died (thanks to Chris) and I hate that he’s lost someone so dear to him… I think all humans (gays, straights, whites, blacks, Democrats, Republicans, Christians, EVERYONE) needs to take a page from his book and be like this. This is what we need to be like instead of fighting and judging each other.